Pots, pans and ingredients in hand Pixel Junk’s new game, NomNomGalaxy, makes for a Soup-er good time. We’ll be cutting away all the Soup-erfluous information and give you a great creamy, but pixelated, recipe for a delicious bowl! Background: In a galaxy where Soup is the number one product in the market, everyone is hopping on the bandwagon to start putting their own soup inside the stomachs of their customers. Now who are the customers, well anyone and anything that likes Soup! Whether you’re on Egon or Alteria or whatever planet, there are soup hungry customers! With rival companies all over it is up to you, a regular Astroworker, working under what could be described as, a monopoly, is given the job to create a market for soup on planets where there is no market. Create the facilities, gather the ingredients, get the soup out for delivery and raise your company to the number one spot, all while defending your facilities from hostile attacks from other Soup providers, sounds like wild time! 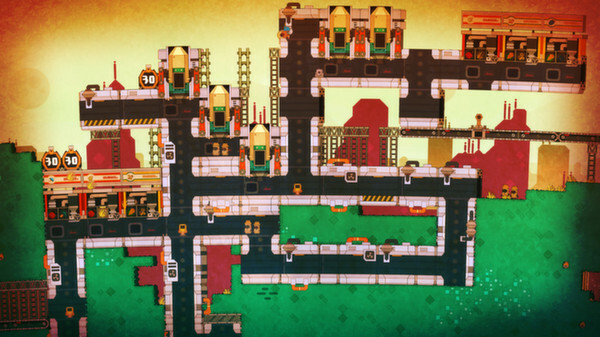 Gameplay: The game itself is built like a side scrolling sandbox although at the same time it is not because of the goals you must follow, rather than free to do as you please as most sandboxes are (even the side scrolling ones.) You are an “Astroworker,” given the ability to gather, fight, create, protect, all to establish your Soup serving company as the planet’s greatest. 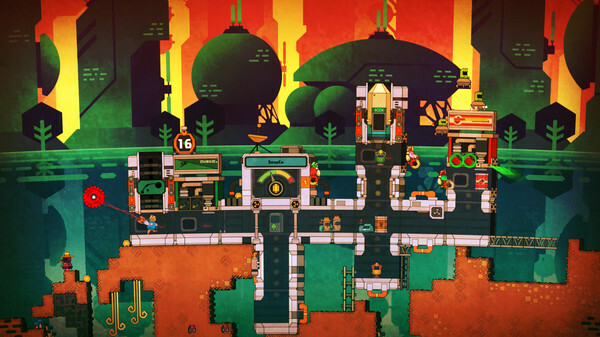 Once reaching a new planet the player is meant to find an area where it would be ideal to build the facilities to make soup! The player must keep the environment around the facilities in mind because this could help or hurt the how quickly and safely the company get’s their soup out to the customers. Under a time limit the of the day the 9-5 shift takes control! Everything must be done within the matter of a day and you have to fill your quota, so the game adds in a bit of a “you’re running a business” aspect as well..oh wait..I think I have said enough! Funny how when you’re reviewing something you enjoyed you just keep going without realizing you can’t say everything! Well you guys got the idea! Final Verdict: In the end NomNomGalaxy filled me up. It was a great feast with many different dishes being served, all soup of course. In all seriousness though, the game is very well built. It’s fun to play, it can take a little getting use to considering how much you have to do all at once, but once you take a taste you will not stop. With different goals to complete, the game gives you a good reason to complete them as well, money. The money progresses your chances of making more money and therefore making the bosses at corporate happy. Purchase on Steam Now! Nom Nom Galaxy Website!